Just a few lines really singing the praises of the series of books entitled ‘VCs of the First World War’. Whilst visiting the battlefields I have seen tours whose focus is solely to visit the graves of Victoria Cross recipients or look at the sites of VC actions. I have always thought that this was a narrow-minded way to view the battlefields and war. By the nature of their deeds, VC recipients were a breed apart and I feel that by too much emphasis on their actions, the real day-to-day grind of the ordinary soldier, be it PBI or artilleryman is diluted. However, I must acknowledge there is some contradiction in my above statement as, when guiding for a recent battlefield tour to Arras, I visited the graves or VC sites of three recipients in a single day; Private Horace Waller, 10th KOYLI, Captain Arthur Henderson, 2nd Argyll & Sutherland Highlanders and Lieutenant Donald Mackintosh, 2nd Seaforth Highlanders. Clearly, their deeds inspire us all and it seems the least one can do when in a cemetery containing a VC grave to read out their citation. This brings me on to the subject matter – the excellent series from the now defunct Sutton Publishing covering the war. 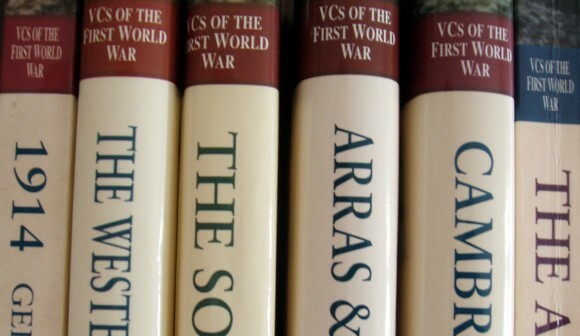 Stephen Snelling’s three editions cover the Gallipoli and Passchendaele campaigns and ‘The Naval VCs’ whilst the ‘The Air VCs’ is compiled by Peter G. Cooksley and, finally, ‘The Western Front, 1915’ by Peter F. Batchelor & Christopher Matson. Each book follows a similar format with a detailed explanation of the VC action and subsequent history of the recipient. There then follows biographical information about the soldier (or sailor) from their birth to death. I have six of the books listed above and each has proved indispensable in my research or when preparing for battlefield trips. I am currently using the Cambrai volume for some work on local hero, Lieutenant Hardy Falconer Parsons VC (more details to follow in due course). They can be picked up pretty cheaply on the net – try www.abebooks.co.uk. I would heartily recommend them as a study aid or even to pick up and read at any odd moment – the bravery contained therein can only inspire us all. This entry was posted on Monday, August 16th, 2010 at 5:39 pm	and is filed under Books. You can follow any responses to this entry through the RSS 2.0 feed. You can leave a response, or trackback from your own site. Nice piece and I totally agree with you. VC actions are always emotive and it is suprising how often you come across the graves of VC holders, especially if you are visiting an area on spec. Nobody can afford not to have their own range of emotions when the details of the action are discovered, and fortunatley for those who find these men ‘by accident’ the cemetery registar has details of their VC wining actions contained under their entry.